I've started a monthly gig at Amnesia on Valencia @ 19th St in SF. The fomat is a round robin of three syntheists rotating three 15 minute sets. A big part is the visual artists (film, vid, liquid lights....) who are also putting some great energy into this. I am in touch with SF Community Radio for a possible Synthestesia radio spot as well. They are on the internet only for the moment, but are planning on getting a terrestrial station together and from what I understand already have the FCC permits. What does this mean for you? If u live in SF or the Bay Area, come down and check it out. Let's get you a gig. The idea is to get people out of their bedrooms and studios and lay it on, make friends, participate. I would like this to be a leaderless co-op once it gets set in motion, so ideas how to get organized will also be helpful. If u dont live here, eventually if the radio thing pans out, please hit me up. The idea for that is we have a weekly featured artist, 45 min pre recorded set with a short interview clip. SF (well everywhere, really) needs more live modular gig opportunities. Tuesday nights are a little tough for me, but will open up a bit after the current semester is over. Can't wait until I can make it out! Great idea. I hope to make one soon. I am local to the Bay Area (south bay) and have been struggling to find good places to perform live modular music. This seems right up my alley! I would love to perform for you! Please feel free to follow me on Instagram. @musicalfungus. I post new patches and videos daily. I recently started a Youtube channel as well. I hope to provide demos and tutorials soon. For now there are a handful of videos of my performing different patches in my studio. @captjrab - How did it go? Could be cool indeed. Do you have a calendar of upcoming shows?... Missed this one but I am also in the area and would like to check it out! Would love to play/attend anything you guys are holding in the future! 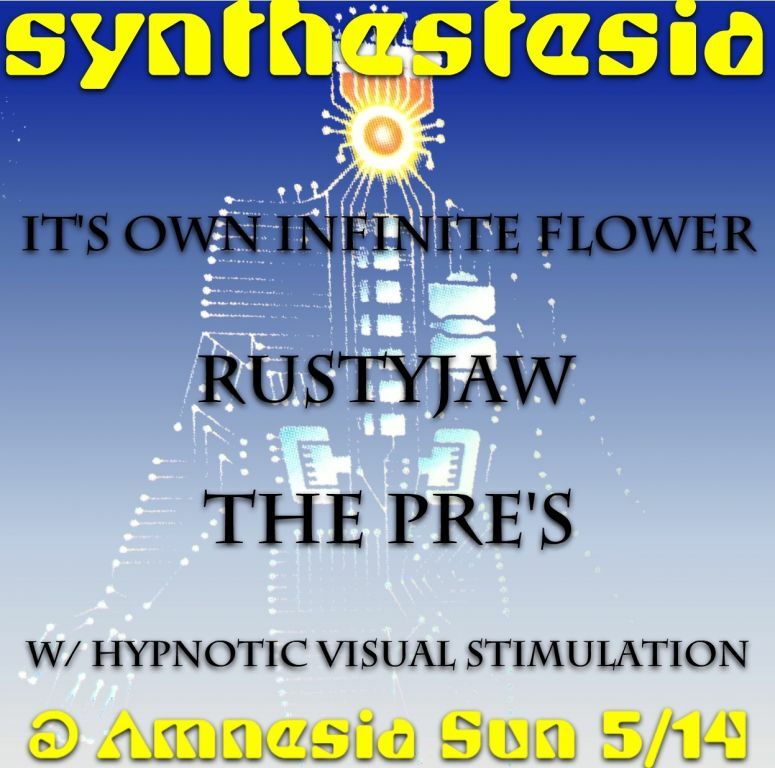 I'm pleased to announce the next Synthestesia gig is happening this Sunday about 9:00ish at Amnesia. I'm very happy rustyjaw is going to perform. I pop his youtube vids on all the time and am a fan of his work. I will make sure and get you all in on this. It's been really fun so far. The films/vids and the soundscapes have synced up beautifully every time with some great humor, political commentary, landscapes, surreal weirdness and postmodern pixel manipulations. Its been cool too because all the musicians so far have brought various and different rigs, from Dave Smith and Roland stuff to Euro, tape recorders, Buchla, chaos pads, moogerfoogers, violin ect. Yep, that's me. A year and a half since I got into modular, and I'll be playing my first live thing ever. I'm pretty psyched and also pretty anxious. Nice, good luck with your first show! I might be able to make it. Well, that was a blast! I have to say the crew that's putting these events on couldn't be friendlier or more supportive. The community-minded focus really comes through. I will definitely be attending more Synthestesia events either as a spectator or a performer. I feel like this was an ideal setting for a first-timer like me. And I think for the most part the three pieces I played went off well. The sole exception was the second one where things got off to a shaky start because I hadn't turned the levels on all my parts back to zero after the first session. So the track sort of started off in the middle, but I kind of went with it, and made something new out of it, LOL. I learned a lot. Both in the patching process beforehand, and in the performing process. I'd say the number one lesson is that the sound in the space is so different from patching at home, I felt a little lost while progressing into the tracks because the aural feedback was so different. Some sounds seemed way more prominent, while others (like some filtered washes of noise I was using), I couldn't hear at all. But from talking to people on the floor, it sounded good to them. As far as patching, I'd never even tried to patch multiple pieces at the same time. That was a challenging exercise. Especially given that I moved to a smaller case for traveling vs my two 9u studio cases. We are really excited to have hooked up with the long time DIY artist co-op ATA. We are back on track to having monthly Synthestesia shows. Hit me up if you are interested in performing. Nice! Been meaning to check out what goes on at ATA... and a synth performance /experimental video showcase is a great time to explore just what happens there. Looking forward to it! Looks like the bill might be full - but if you're still seeking another performer, please let me know. The bill is set for this round, but next time is open. This looks great, thanks for keeping these going!! Thanks, hope to meet you in person. Btw, I hear there are a lot of people on facebook these days. Is this true? This looks really great! wish we had something like this in the nY area... great idea! Reach out there and get some people together. Not sure where in Westchester u are, but Portchester had a hip open minded vibe (its been a while since I played there). The gig went great last night. R Beny pummeled my mind with the ER 301. the film experimentation was inspirIng. ATA is a great venue. Hoping we can book another show there in a couple months. 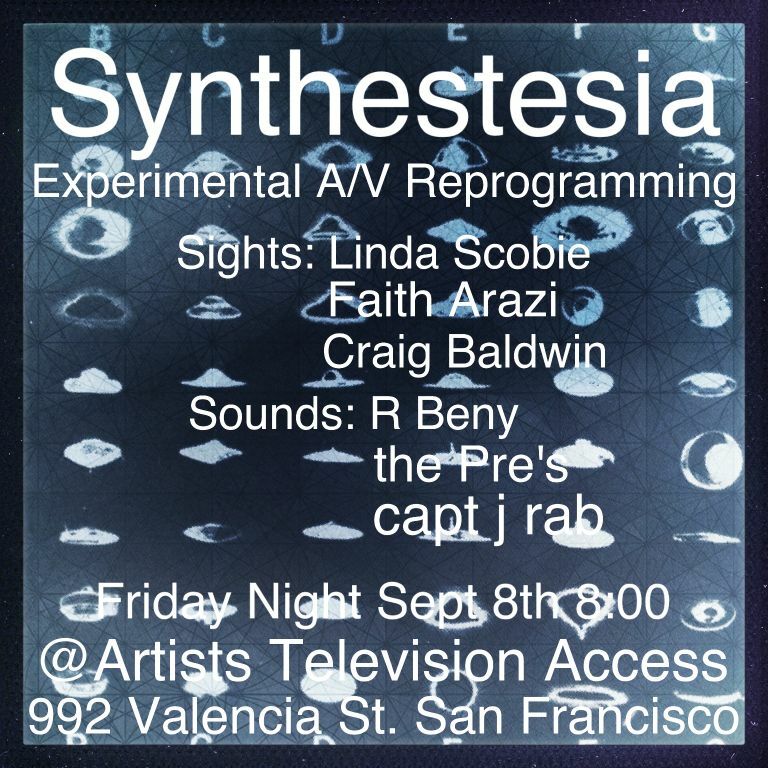 I need someone to perform at Synthestesia in Oakland for 10/8. 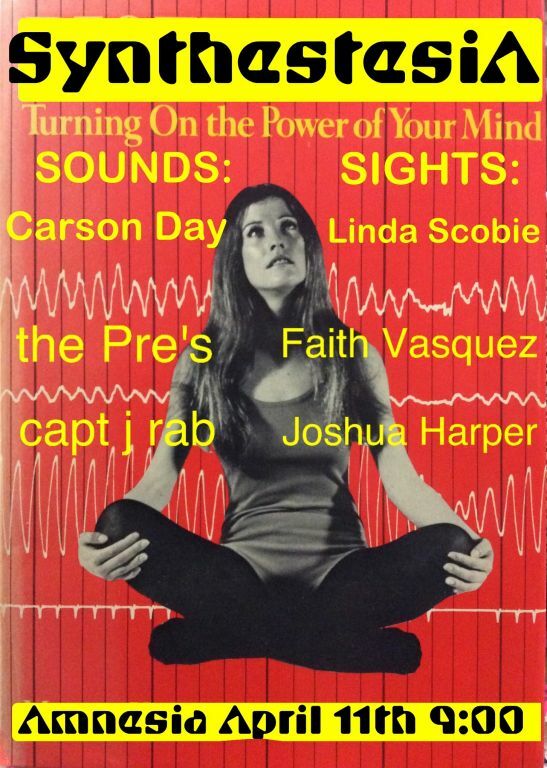 PM me If u are an East Bay synthesisist and interested in performing some experimental soundscapes. Great show last Friday, you guys! All 3 performers did a really good job. Great vibes, and the films were terrific. Thanks for hosting captjrab! Thanks momolithicfungus! Hope to do it again in November plus Oakland in October at the Temescal Arts Center.